Technology gone mad or sheer genius? My recent blog about talking billboards seems quite sedate compared to the latest invention coming from Japan. Developers in Japan have created a billboard that scans the person in front of it to decide what advert to display. There is a camera behind the screen that will capture the person's image and a sensor that then determines their approximate age and gender. This then triggers the screen to play adverts which then match the person's profile. If you were to tootle on over to Shinagawa Train Station in Japan, you would find a drinks vending machine using this futuristic technology to vend drinks to the public. 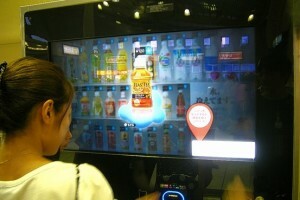 The touch screen monitor on the machine scans the person standing in front to recommend which drink fits their profile. This naturally raises privacy concerns as there are currently no regulations that prevents signage systems from storing image. People walking past a billboard won't have a choice whether they are scanned or not. There's a lot to be said for targeted marketing, the more relevant we make the marketing message for individual consumers the better. It means advertisers potentially get a better ROI and consumers don't have to be bombarded with messages that they aren't interested in. In my humble opinion, I think the drinks vending machine that recommends a drink for you based on your age and gender is a gimmick. The old saying 'Don't judge a book by its cover' comes to mind. Will it really get to a stage where we have machine's deciding which drinks we want? Time will tell as to whether this technology will revolutionise billboard advertising in the future, my view is that cameras and sensors in a billboard won't provide enough information to successfully determine what consumers are interested in.